Ahead of the world premiere of the omnibus film Asian Three-Fold Mirror 2016: Reflections, the first-ever co-production between Tokyo International Film Festival (TIFF) and The Japan Foundation Asia Center, the three acclaimed directors and their lead actors appeared at a press conference to discuss the challenges and discoveries they experienced in the year since the project’s launch at the 28th TIFF. Their remarks left no doubt that the project’s aims had already far exceeded expectations. The collaboration, which will continue until the 2020 Olympics and Paralympics, brings together Asian directors of global renown to create portraits of a character living in the region who is connected in some manner to another Asian country, and requires that they shoot on location in an Asian. The rest was left up to the directors, who reflected unique perspectives on their own nation’s society and culture, like the images in a three-fold mirror. Under lead producer Takeo Hisamatsu, the films are being created to help deepen mutual understanding and empathy through the powerful medium of cinema, and to provide opportunities to explore today’s Asian identity and ways of living. What were the biggest discoveries for the directors? For Japanese director Isao Yukisada, who shot his film Pigeon in Malaysia, it was the realization that each nation’s crew has its own shooting culture, but that the best collaborative filmmaking should make room for both. For Sotho Kulikar, whose Beyond the Bridge was lensed in her native Cambodia, it was that the cultures of Japan and Cambodia merged comfortably in the course of creating the film. 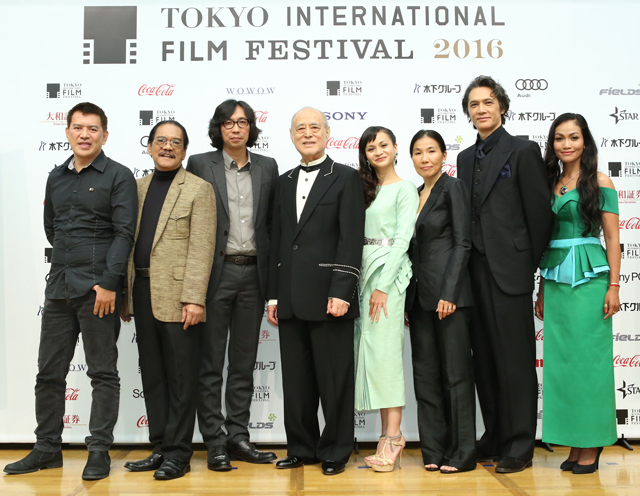 For Brillante Ma Mendoza, shooting for the first time outside his native Philippines to make SHINUMA Dead Horse, the greatest discovery was that even a flight cancellation in snowy Hokkaido could be incorporated into his film, with cast and crew adapting readily to the change. One of the Philippines’ most heralded directors, Mendoza’s film stars legendary actor Lou Veloso as Manny, an illegal Filipino immigrant who has worked odd jobs on a horse farm in Hokkaido for 30 years. When he is unexpectedly discovered and deported, Manny returns to his home village, only to discover that he no longer has a place there. Although he’s able to once again work with horses, he sees his own future in theirs: once they’re no longer able to work or race, they are completely expendable.